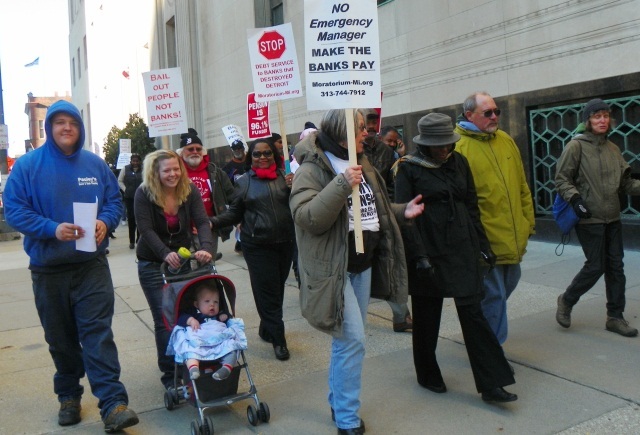 Crowds took the streets outside federal courthouse to stop Detroit bankruptcy Oct. 23, 2013. Protester decries Orr appointee’s racist statement on hoodies. 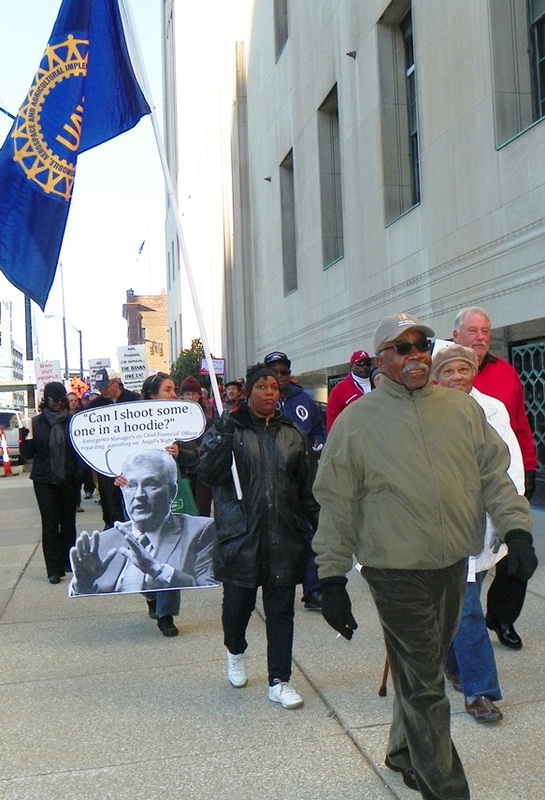 DETROIT – At least one thousand city retirees and their supporters, including leaders of virtually the entire union movement, and many from community and faith-based organizations, took the streets in front of the federal courthouse in downtown Detroit for hours on Oct. 23. At the start of the march, the crowd was big enough to circle the building without a break. Inside, U.S. Bankruptcy Judge Steven Rhodes kicked off the eligibility trial in Detroit’s Chapter 9 Bankruptcy case, the largest in the nation’s history. The filing is also only one in the country initiated by an unelected official, Detroit Emergency Manager (EM) Kevyn Orr, under state Public Act 436. Early on, Judge Rhodes ruled definitively that he recognizes Orr as the official representative of the city of Detroit, and in an unprecedented move extended bankruptcy protection to state officials including Mich. Governor Rick Snyder, who is to take the stand Mon. Oct. 28. 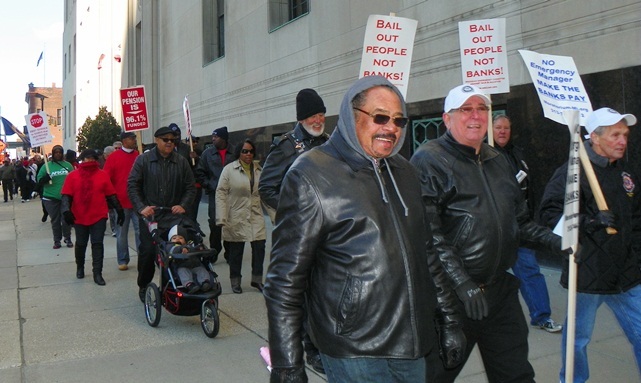 Protesters decried banks’ role in Detroit takeover. Rhodes’ impartiality is seriously open to question. More than a year ago, he chaired a forum on Chapter 9 bankruptcy and EM’s which featured Charles Moore of Detroit consultant Conway McKenzie, a chief witness in the trial. Also on the panel were a drafter of PA 4, PA 436’s predecessor EM law, and EM trainers. 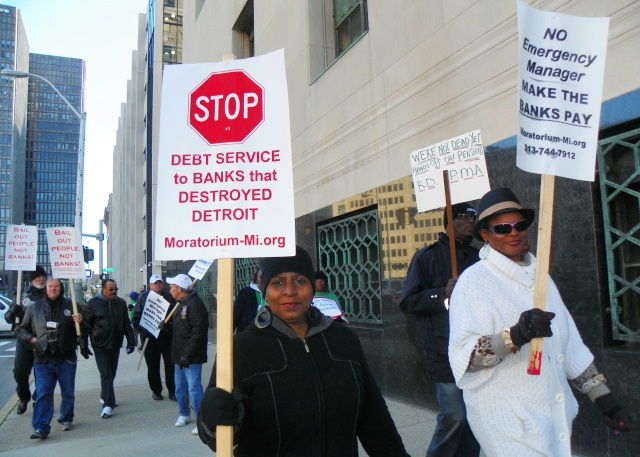 The possibility of a Detroit Chapter 9 bankruptcy was discussed at the forum long before Kevyn Orr was a gleam in the eyes of the banks and Michigan Gov. Rick Snyder. 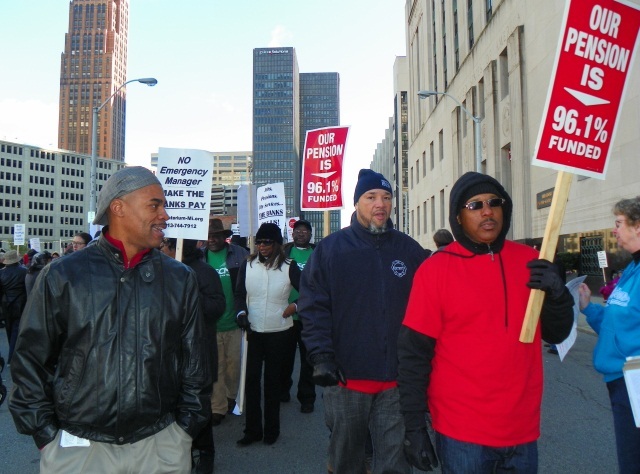 The presence of protesters in unprecedented numbers showed that many are increasingly distrustful of Rhodes’ ultimate ruling in the case and sense that broad mass action is necessary to stave off the destruction of Detroit. 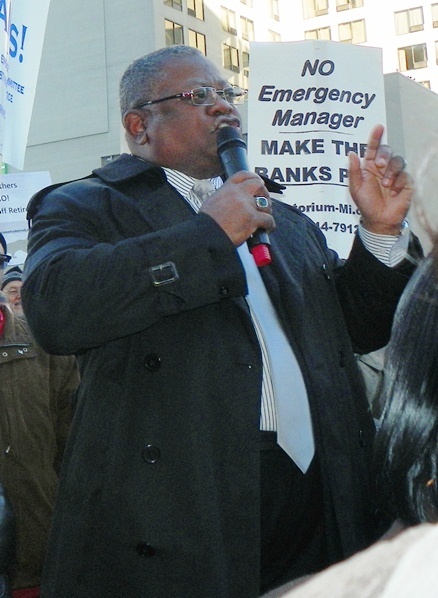 Ed McNeil of AFSCME Council 25 speaks at rally. He noted that Detroit financial czar Mike Illitch is planning to build an $881 million hockey stadium and upscale housing/retail complex in midtown Detroit, athough Illitch’s Red Wings owe the city $70 million in taxes. DTE, which is set to run the newly-formed Public Lighting Authority, shutting down Detroit’s Public Lighting Department, owes another $170 million, McNeil said. 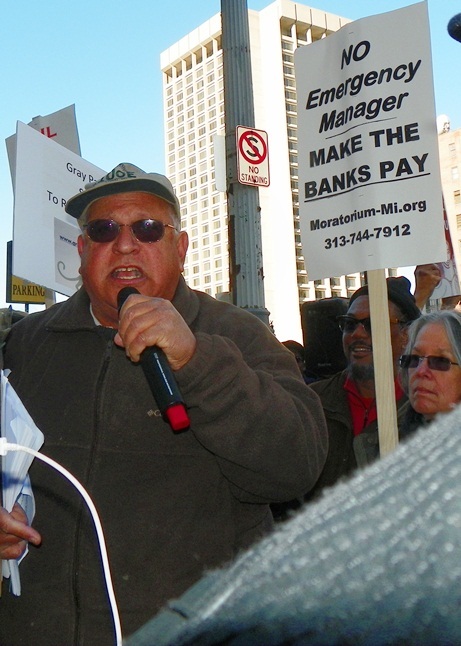 Jerry Goldberg of Detroit Debt Moratorium NOW! Rhodes is pressing ahead at breakneck speed with the eligibility trial, despite broad outstanding issues objectors have asked to be addressed prior to the trial, related to District Court level constitutional matters. News reports have indicated Rhodes expects the trial to last five days, despite a 132-page order he issued Oct. 24 listing a multitude of issues to be debated. 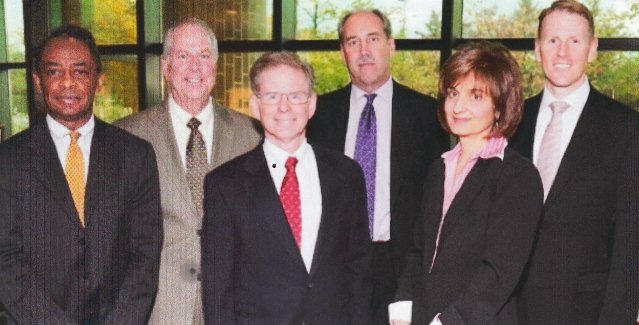 Pro-EM forum Oct. 20, 2013: (l to r) Frederick Headen, Edward Plawecki, Judge Steven Rhodes, Douglas Bernstein, Judy O’Neill, Charles Moore. Rhodes declined comment on his stance during the Southfield-based forum, which involved a broad discussion after the panel presentations. Rhodes was hardly an expert on Chapter 9 bankruptcy at the time, having handled only one other much smaller Chapter 9 case. That was the 1994 case of “Addison Community Hospital Authority.” In it, Rhodes barred the “Concerned Citizens for Addison Community Hospital” from intervening as a group. Addison is located just south of Jackson, Michigan. 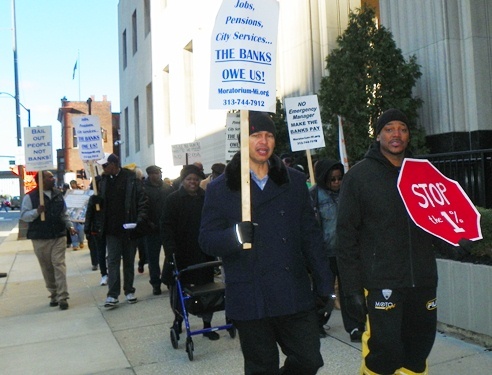 Anti-bankruptcy protesters Oct. 23, 2013. The FBA and the U.S. Trustees’ office both said that the forum was not videotaped or transcribed, but the Oakland Legal News gave a brief description. A broader article in the Flint-Genessee Legal News expanded on the panelists’ comments, which were universally critical of public officials as opposed to business executives, advocating downsizing of city workforces and land. “Frederick Headen, Director of the Bureau of Local Government Services in the Michigan Department of Treasury, discussed the various Michigan statutes relating to emergency managers,” said the Oakland Legal News. 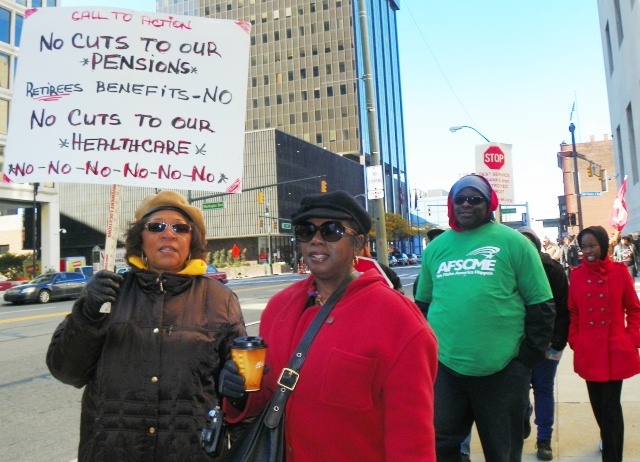 Protesters included very senior retirees. 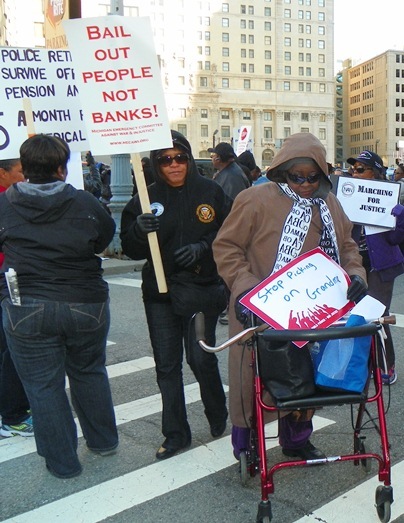 Grey Panthers speaker said bankruptcy is an attack on all older people in violation of federal law. Conway McKenzie has a one-year $19.3 million consultant contract on the Detroit bankruptcy case, and has already been paid nearly $3 million. The firm’s Charles Moore is one of the chief witnesses Orr plans to call in the Detroit Chapter 9 eligibility hearing. “Why aren’t municipalities addressing these issues?” Moore asked during the forum, according to the Flint article, referring to what had been termed excess numbers of municipal workers in Detroit. 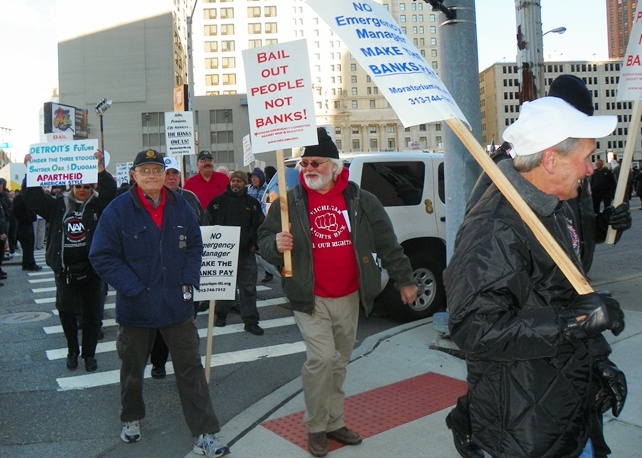 Protesters demand jail for those pushing bankruptcy and theft of pensions. Retirees came out en masse. PA 4 was resoundingly defeated in a state referendum at the polls in Nov. 2012, with only four of 83 counties approving it. PA 436 was birthed in the dead of the night during a lame-duck session of the Michigan state legislature, which added an appropriations clause to prevent another referendum. Protesters brought their babies and children. Bernstein, often quoted in the daily media as a bankruptcy expert, also helped train candidates for emergency manager positions along with other Plunkett Cooney Associates, according to their website. Plunkett Cooney itself held a similar forum in April of that year. According to the Flint paper, Headen said during the forum that he has served on 16 financial review teams, five each under former Michigan Governors John Engler and Jennifer Granholm, and six “so far,” under Snyder.“ He took a highly anti-union, anti-worker stance in his remarks. 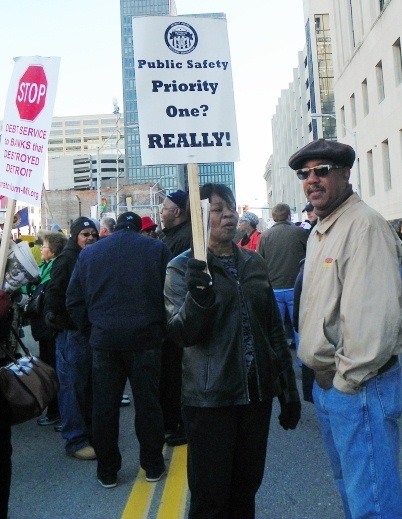 Public safety workers don’t even have Social Security to fall back on. Plawecki appeared to be the only participant taking a somewhat measured view. “I hear all the time that we [Detroit] have too many police officers,” Plawecki said according to the Flint article. One attendee at the forum defended Rhodes’ role. Rhodes earlier denied eloquent motions filed by the Official Retirees Committee, constituted at Orr’s request, to stay the bankruptcy proceedings until a higher-level U.S. District Court determines matters of constitutionality vis-à-vis the state and the federal government. Cancel the Debt banner has been at every rally against EM Orr and bankruptcy case. Rhodes has not yet ruled on motions filed by the Michigan NAACP et al and Phillips et al to lift the stay on two lawsuits challenging the constitutionality of PA 436, the Emergency Manager law which put Orr in place. The suits have been pending before U.S. District Court Judge George Caram Steeh since before Orr’s July 18 Chapter 9 filing, and challenge Orr’s capacity to file bankruptcy as an unelected official. More babies showed up; their futures are at stake. Clearly angry at Rhodes’ stay, Steeh ruled, “Although it is not apparent that any interests of the City of Detroit bankruptcy proceedings are implicated in the case, the plain language of the stay order would apply to this lawsuit. In accordance with the broadly worded Extension Order issued by the bankruptcy court, this court will abide by the stay unless and until such time as an order issues lifting or modifying the stay to permit the captioned matter to proceed.” (Emphasis added in Phillips brief). Firefighters were out in force. According to his Oct. 24 order, Rhodes appears to be planning to decide the constitutional questions himself during the eligibility trial, despite his lower role in federal court. He has said that objectors can still appeal his actions to the District Court. 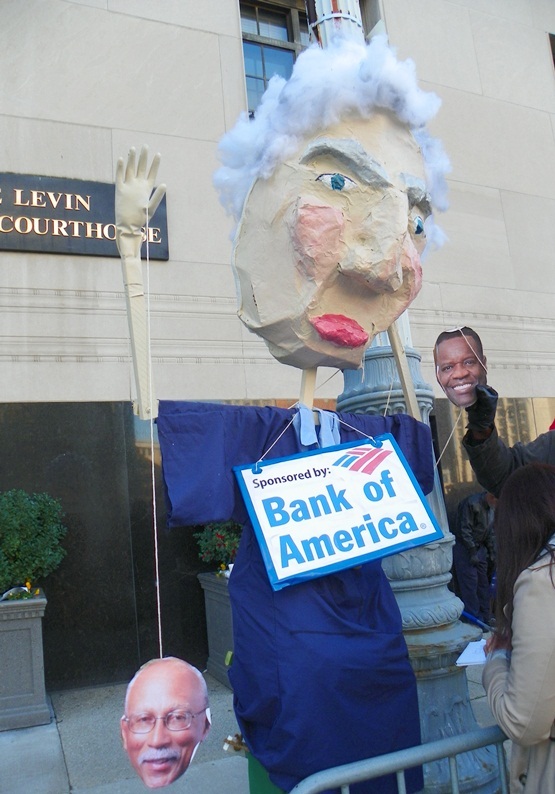 Meanwhile, however, Orr is moving full speed ahead with the dismantling of Detroit, having ordered a state lease of Belle Isle, a takeover of the Public Lighting Department, and a $349 million “debtor-in-possession” loan from Barclay’s, a chief participant in the global LIBOR interest rate-rigging scandal. 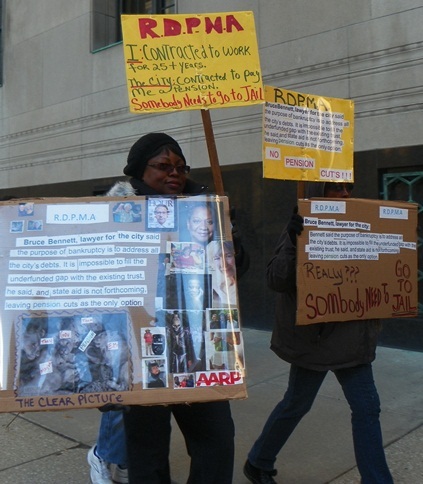 Protesters compared Detroit takeover to apartheid. Orr’s Barclay’s proposal must still be approved by Rhodes. The loan is intended to pay off UBS AG and Bank of America, other LIBOR participants who have been sued by government regulators across the world, on a $250 million swap deal. The deal is related to the disastrous 2005 $1.5 billion pension obligation certificate loan pressed on Detroit by Wall Street ratings agencies Standard and Poor’s and Fitch, and implemented by former Detroit CFO Sean Werdlow, who promptly took a position with UBS AG’s minority partner in the deal, Siebert, Brandford and Shank. 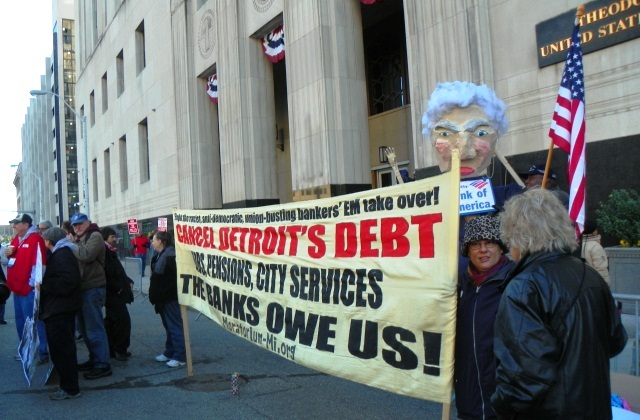 That deal would cut off any further action by Detroit to recoup the losses it suffered on the debt when the stock market crashed in 2008, or the cancellation of the entire debt if it was negotiated under fraudulent circumstances. Attorney Vanessa Fluker demanded at the City Council hearing on the debt that Orr obey the dictates of PA 436 and investigate any criminal actions which contributed to the city’s financial crisis.